As I’ve come to learn at the ripe old age of 24, the most difficult aspect of being an adult is making decisions. I am, by nature, a somewhat indecisive person and can be hesitant to dive in to new experiences, opportunities, etc. I always find myself seeking the perfect answer or opportunity, and drive myself crazy wondering if I’ll know said opportunity when it comes along. But being an adult also means coming to terms with the fact that nothing is ever perfect and that you’ll never know the answer to everything. Rather, you just have to go with the knowledge that is in front of you and make the best decision that you can. For me, this past year has been full of BIG decisions and plenty of opportunity for me to get outside of my comfort zone. I’m getting better at being decisive. Growing up, my mother always told me to go with my gut and it’s something I took to heart. The voice inside you and literal “gut feeling” often knows better than your brain does. What started out as a quick pen sketch, developed further through a layer of colored pencil I threw over top of him to give him a pop of fun and flair. I love how cartoon sketches can be so simple, yet also challenging. There is a certain level of difficulty that comes with capturing a character’s likeness through a limited number of lines. Thanks for your words of wisdom, Mom. I know it will continue to serve me in this crazy journey we call life! P.S. You can expect to see this one in your Christmas stocking! It’s finally April and although it doesn’t feel like it in New York, I am so incredibly ready for spring. Unsurprisingly, this yearning is finding its way into my work. 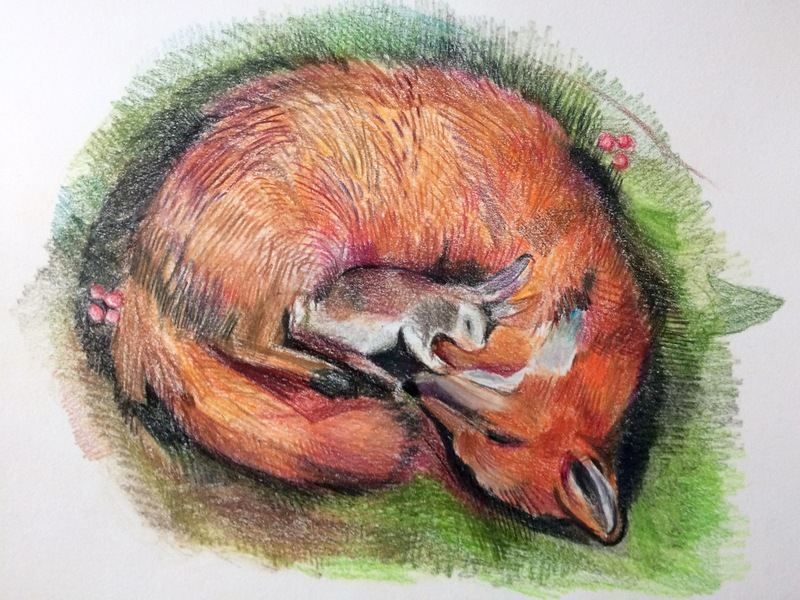 Today I’m sharing a recent drawing of mine that plays homage to the transition period between winter and spring – although the weather may start to warm, we must always endure the inevitable period of rain and mud before the flowers begin to bloom . I was so taken with this piece when I first saw it. The dress felt like the perfect mix between high fashion and a fairy’s ensemble, and you can’t help but be drawn in by the contrast between structural and organic elements. Like many of my recent drawings, the piece was created using Prismacolor Premier colored pencils. I’ve really taken to drawing watercolor-styled flowers with this media and enjoyed switching back and forth from blending smooth, organic shapes to going back in with sharpened tips to restructure and add detail. If you’re unfamiliar with the work of Alexander McQueen, I highly recommend you check out the book Alexander McQueen: Savage Beauty. This compilation of his pieces was first introduced to me during my undergraduate studies by my Fiber Arts Professor and is brimming with inspiration. You can’t be a modern artist without appreciating McQueen; it just isn’t possible! Fingers crossed that spring is on the horizon! Words cannot explain how excited I was to have a white Christmas this year! With all the Christmases of my childhood having been buried under several feet of snow, the green holidays we have experienced lately have left me feeling – ironically – a tad blue. This year in New York, much to my excitement, we were surprised with a dusting Christmas Eve which continued through Christmas morning. Those of us who had the pleasure of growing up in chillier climates know that to a child, snow is just about one of the most wonderful things there is, especially around the holidays. Snow days, sledding, building snow people… the possibilities are truly endless! Living in a seriously snowy region, a favorite pastime of the adults in my community is complaining about the winter weather. “It’s difficult to drive in,” “I hate shoveling,” “I’m freezing,” etc., etc. Another beautiful thing dissected and tarnished by the pessimistic eye of adulthood. In this drawing, I was aiming to capture the love of snow that some of us (myself included) have managed to hold onto into adulthood and perhaps remind others that even as adults, we can still find magic in our everyday lives. 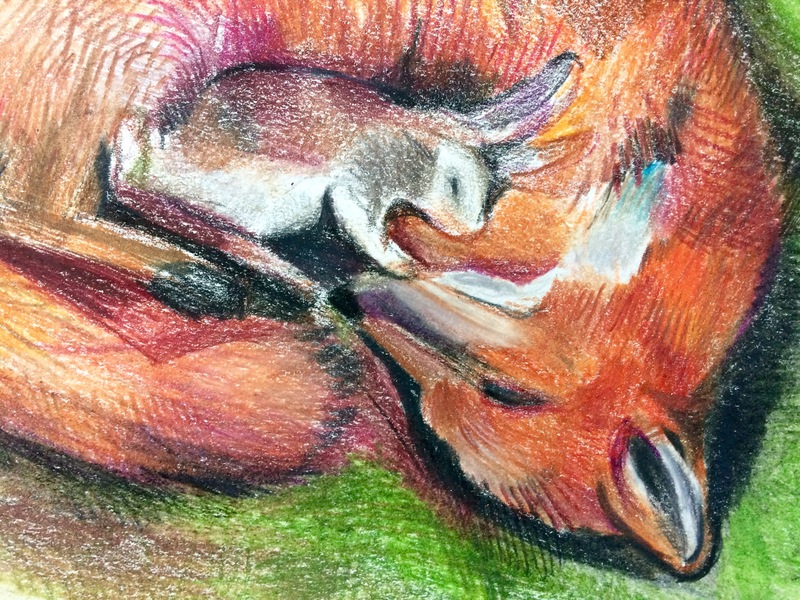 Animal imagery is by far my favorite subject matter for drawing, especially that which can inspire a sense of magic. One particular species that has captured my attention over the years is the luna moth. If you’ve ever seen one #IRL then you will understand my fascination. For those of you who haven’t, then what you have to understand is that seeing a luna moth is like seeing a real live fairy. Even in the pitch black of night, they positively glow, emitting a soft light as they fly through the air. Truly, you’ve never seen anything like it. My comparing luna moths to fairies stretches back to my undergraduate years, during which I time I created a piece that commented on the role science has played in the demise of myth. The piece (seen below) features a repeat silkscreen pattern of a luna moth, meant to mimic a butterfly board, with a 3D soft-sculpture fairy pinned to the center. The fairy, which symbolizes the death of myth and magic in the modern world, is adorned with a luna moth printed on his chest. 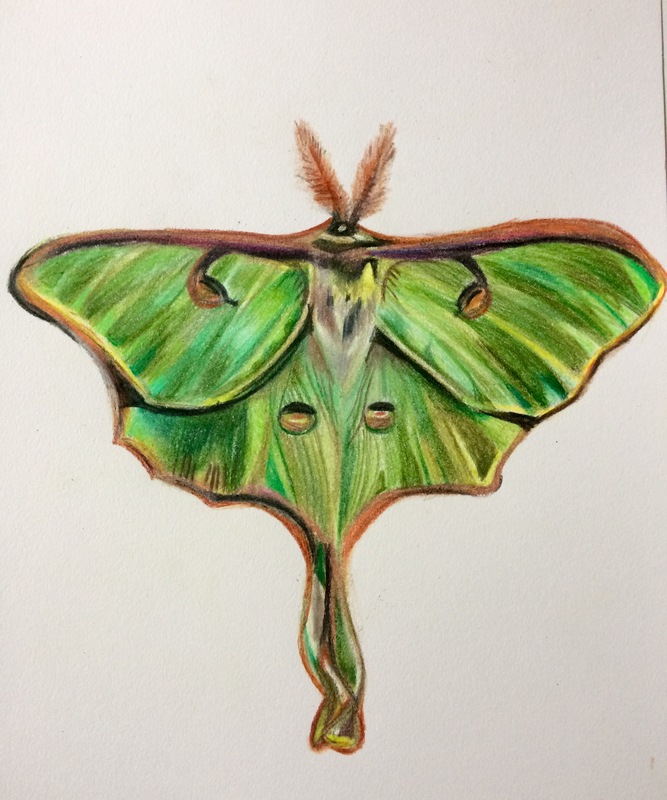 I recently revisited the luna moth, in a cheerier, simpler piece, and was excited to tackle the variety of greens found in their wings with my Prismacolor pencils. I surprised myself, finishing this drawing rather quickly, all the while immensely enjoying blending the colors together with the blending tool. Although wing symmetry proved to be a bit daunting at first, the beautiful things about nature is that it’s rarely ever perfect! First thing is first: what is Rococo? Having been an art major in college, I took my fair share of art history courses and would be more than happy to fill you in. While most of us have at least heard of movements such as Impressionism (You know, the blurry French paintings? Monet?) or Cubism (think Picasso) the term Rococo isn’t quite as mainstream. (Needless to say, Rococo is a wee bit flirtatious). If not, perhaps you’ve seen my personal favorite of the period “The Embarkation for Cythera” by Jean-Antoine Watteau. Either way, you get the picture. Debate among Disney-enthusiasts has not yet revealed a conclusive answer as to whether or not the fairy tale is meant to be set in the Baroque or Rococo time period. Either way, we know it’s French and it’s beautiful, and maybe that’s all we really need to know. All of which brings me back to main point, which is to share with you my latest drawing, inspired by “Beauty and the Beast” aesthetics. Although they’re no Mrs. Pots and Chip, these tea cups stand up in their own right (literally and metaphorically speaking). Inspired by an image I came across on Pinterest, I loved blocking in the variety of colors with Prismacolor pencils. The smooth texture was later achieved by blending the pigments together with a blending pencil. Hopefully you find this drawing inspiring – I know you’re just excited about tonight’s movie release as I am – and stay tuned for future “Beauty and the Beast” inspired artwork!